These beautiful and tastefully decorated townhomes offer larger accomodations for families and groups that don't want to be split up into several condos. Larger units are extremely difficult to find in Keystone Resort, so these are set to become a firm favorite for return guests. The Townhomes are nestled in the stands of Lodgepole Pines at the base of Soda Springs Road, only about 1/4 mile from the Mountain House Base Area lifts and only a few steps from the local shuttle stop. A great hide-away but convenient for all of the restaurants and nightlife of the main Keystone Village. These three level Townhomes are well equipped with all that you could need for an unforgettable family vacation. 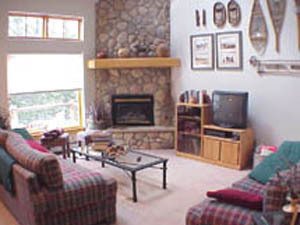 There are one car private garages (with room for a second vehicle in the driveway), Washer/Dryer in each unit, private baths in each bedroom with an oversize jetted tub and a separate shower stall in the master, fully equipped kitchens, private decks, large open living/kitchen/dining areas with vaulted ceilings and an airy feel.